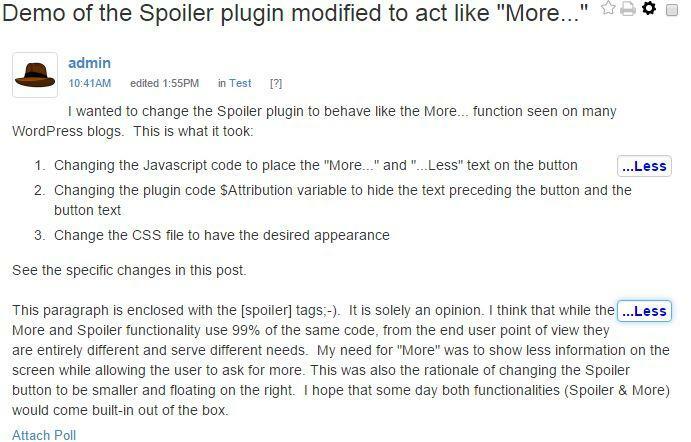 Discussion Modifying the Spoiler plugin to act like WordPress "More..."
Modifying the Spoiler plugin to act like WordPress "More..."
This discussion is related to the Spoilers addon. First thanks to @peregrine and @hgtonight who helped me get to the point of being able to make this change. I wanted a functionality similar to the "More..." button seen in many WordPress blogs. I wanted it to be minimalistic - small out of the way button, no special border and backgrounds, and to say "More..." and "...Less". 3) Change the CSS file to have the desired appearance. The only thing I am not convinced of is the issue of posting the modded plugin. I understand that for the developer and other experienced modders it is preferable to see the changes posted (and explained) in this discussion. But I see so many newbies (like me) who are not yet programmers and who would find benefit from ready-to-use modifications. Thanks @linc. I hope one of the styles you will support will be a "More..." similar to the above.